The NFL season doesn’t start for another four months, but that doesn’t mean reigning NFL MVP Cam Newton can’t scrimmage with a bunch of seventh-graders if he wants to. 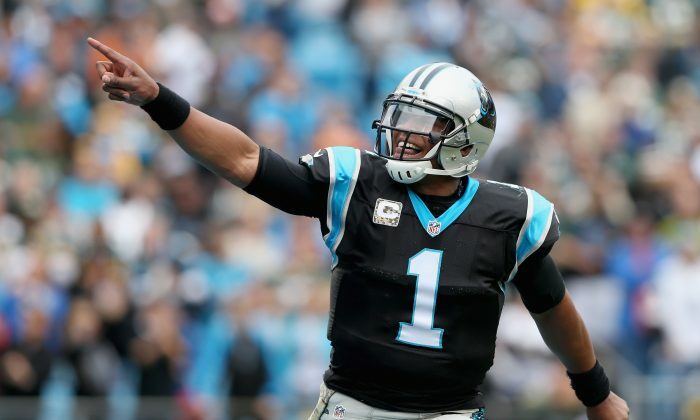 Local news footage shows Newton hopping a playground fence and throwing passes while surrounded by a large group of students at the Community School of Davidson in Davidson, N.C.
Newton happened to be driving by the school when he spotted a kid on the playground wearing his Carolina Panthers jersey. Mimi Siadik, a seventh-grade teacher, said that Newton asked the teachers for permission and then jumped the fence to throw the football around with the students, according to a report on wsoctv.com. “The students just herded all around him. I still can’t believe he did that,” Siadak said. Of course Newton did his ‘dabbing’ pose with students and got the kids to a heckle a teacher wearing a Steelers lanyard. Naturally the surprise visit was a thrill to the students. “I saw one girl crying and hyperventilating and when I asked, ‘Sweetheart what’s wrong?’ she said, ‘That was just the best moment of my life,'” Siadak said. When the real season starts in late summer, Newton and the Panthers will be expected to be a Super Bowl contender, like they were last season when they went 15–1 and fell to the Denver Broncos 24–10 in Super Bowl 50.